This is some of the sloe gin which I started last winter - isn't it BEAUTIFUL?! I'm like a proud mother or something. As you can see, it wouldn't all fit into the bottle, so I just had to sample the leftovers...mmmmm!!! We had some very fruitful walks during September/October/November last year and judging by the blossom so far, 2012 will another good year for foraging. 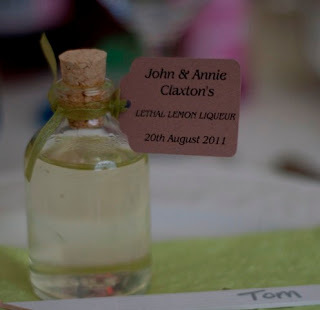 Last year we made a version of the Italian Limoncello - we called it John & Annie Claxton's Lethal Lemon Liqueur and gave away tiny bottles of it as favours for the male guests at our wedding picnic. I was so chuffed to find these little bottles from http://www.miniatureglassbottles.co.uk/ - they were so helpful and even the little tags were included. Sorry...I forgot to answer your question you left on my blog. Thanks Linda - I'm off to do a bit of virtual browsing right now!